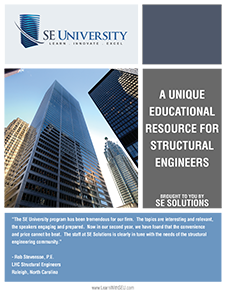 SE Solutions is pleased to announce the launch of SEU Resource Center™ to further assist SE University™ subscribers. The goal of this client portal is to provide additional technical information and allow structural engineers to manage their learning options and PDH tracking with greater ease. SEU Innovation Hub™: access additional technical content on a variety of topics to increase productivity. SEU Session Library™: access recordings of prior SE University sessions (from your subscription period) at any time. In addition, handouts and registration information for upcoming sessions will be posted here. SEU Attendance Tracker™: upload your seminar attendance lists in one common repository to simplify tracking Professional Development Hours.